Cook with the best of both worlds - grilling and stir-frying! 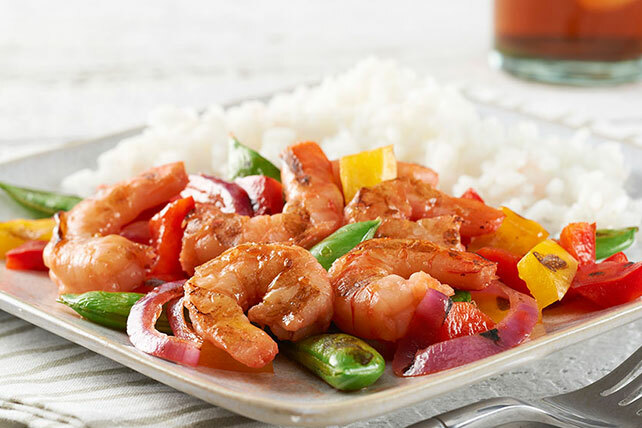 You'll enjoy taking a bite of our Shrimp 'Grill-Fry,' with the taste of bell peppers, snap peas and other delicious flavors. This shrimp grill is sure to become a new household favorite! Heat grill pan on grill grate on high heat. Combine peppers, onions and 2 Tbsp. dressing. Combine shrimp, soy sauce, ginger and remaining dressing in separate bowl. Spoon pepper mixture onto hot grill pan; cook and stir 2 min. Add shrimp; cook and stir 2 min. Add peas; cook and stir 2 to 4 min. or until shrimp turn pink and peas are crisp-tender. A grill pan is a pan with small holes or perforations in the bottom of the pan used to cook small pieces of food on the grill. If you don't have a grill pan, you can make your own by poking small holes in the bottom of large disposable aluminum foil pan. For a fragrant toasty flavor, add 1 tsp. sesame oil to the stir-fry with the peas. Prepare using KRAFT Italian Roasted Red Pepper Dressing. This low-calorie and low-fat main dish is high in vitamin C from the peppers.